How does a typical home air conditioning system work? How does the air conditioning system inside a home become a source of microbial contamination? Does microbial contamination in my air conditioning system impact the quality of the air in my home? What are the human symptoms of a contaminated air conditioner? Can you prevent the growth of these biologicals? Why would a growth free system last longer? How frequent should I have my system cleaned? 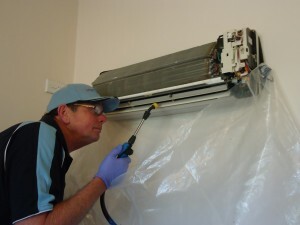 All home and office air conditioners, after regular usage, become infected with “microbial contamination” – This contamination includes fungi, mould and bacteria. Air Conditioners are the perfect environment for such contaminants and of course they become constantly airborne every time you switch your air conditioner on. Mould combined with humidity can be a potent mix!!! Consumers are generally not made aware of the need to regularly clean their air conditioners and are under the belief that cleaning the filters is enough. Cleaning your filters is “simple maintenance”. After regular usage the whole head unit also needs to be “correctly cleaned:. Air is drawn from the room in your office or home through a return grill and passes through an air filter and into a furnace (or air handler). Inside of the air handler is the circulating blower, and a heat exchange coil commonly called the evaporator. The evaporator is cold and thus removes heat from air that blows across it. In addition to removing heat, water also leaves deposits on the evaporator surfaces. The cooled air returns to the room via outlet grills. The moisture falls into a drain pan under the evaporator and drains through a pipe out of the system. The air drawn into a system in your home or office contains dust, much of which is biological spores and other organic particles. Even the best filters capture only part of this material. Much of the rest falls out of the air stream onto the heat transfer surfaces. It combines with the water and the spores germinate and grow rapidly (or amplify). Yes. “Contaminated” air conditioning systems can become breeding grounds for mould, mildew, and other sources of biological contaminants and can then distribute these contaminants through the home. System components can act as direct or indirect sources of particles and/or volatile organic chemicals (VOC’s). Of greatest concern is biological growth and bio-aerosol generation, most of which are potential allergens. Airborne allergens in the home constitute one of the hardest types of allergens to avoid. Unfortunately, heating and cooling air conditioning systems are excellent harbours for moulds, and this system is an efficient distribution system. Keep your home or office system clean and treated with a broad spectrum antimicrobial, which not only kills micro-organisms (i.e. mould, mildew, fungi and bacteria) in the system but will inhibit their growth for up to 6 months. Can keeping my system clean and free from growth provide other benefits? Most corrosion in air conditioning systems is caused by sulphuric acid secreted by common bacteria that chemically combines sulphur from the air with hydrogen and oxygen from water. These chemicals will have an adverse effect on the aluminium coils. Indoor Environmental Quality Standards Australia (IEQSA) specify that the frequency of decontamination and cleaning split air conditioners should be assessed on a case by case basis considering usage, room size and location etc. however not less than once per year. Where health issues are present including allergies the frequency of cleaning should be increased.